Submitted by Jeff Buster on Sun, 04/22/2007 - 19:24. I studied Latin in High School. Mr. Feser was our teacher. I remember Gallia Est Omnis Divisa in Partes Tres, but I remember even better Mr. Feser’s warnings about TV. These were the days of the “Red Scare” - someone in our government had figured out that the Chinese were red (communist) and that they were after the USA. The Korean war was a not so distant decade back and the US was building nuclear warheads about as prolifically as automobiles. Mr. Feser had the solution: send every one of the television sets in the US to China. A sort of Trojan Horse. If the Chinese then watched as much television as the school kids in the US were watching, this would put the Chinese so far behind academically they could never catch up with us again. There would be no war. I don’t think Mr. Feser was really serious about wanting to hurt the Chinese by exposing them to hours of wasted time in front of our television sets, but Mr. Feser was serious about the damage that he believed TV was bringing to the US. The average TV watching time per day was 7 hours. Mr. Feser also told his classes about his summer work at Fort Laramie, Wyoming. He worked for the National Park Service and took his family (as I recall he had a few daughters) along. Mr. Feser was an expert on the Sante Fe Trail, knowing every detail. He had pictures of the rock buttes with famous pioneer’s names carved in the stone. My family never had a TV, so I didn’t have to exercise much over Mr. Feser’s advice. It wasn’t until my kids were in the Waldorf School that I heard teachers with the anti-TV mantra again. There are those that believe that television can permanently damage a person’s creativity. That the flickering buzz and flashing phosphors can reduce a child’s head to pabulum by actually shutting down certain responsive sections of the brain. I’m one. For sure, the time spent watching TV is time not spent on something else. 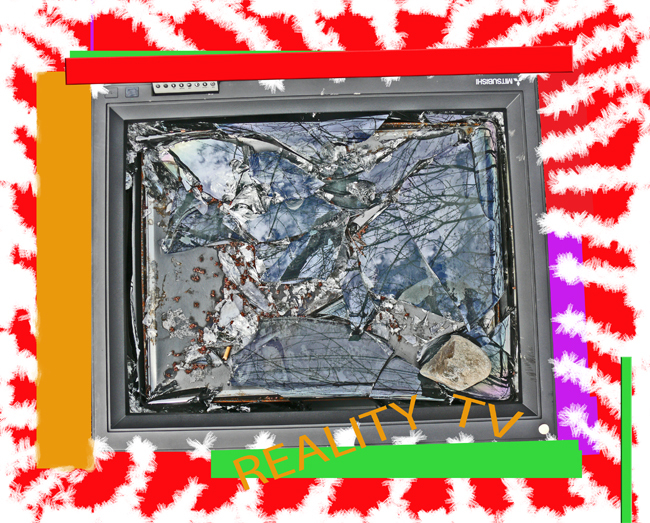 Then the other day when I was riding my bike to the library - and going over the Rail Road tracks on an old bridge that was closed to cars - I saw this big TV laying smashed face up on the ground. Immediately I thought of Mr. Feser. Here was a television “set” after his own heart. Bashed with a rock and used as an ashtray. The broken glass was almost an inch thick at the edges (so the screen could be flatter). No wonder TV’s are so heavy. How had it gotten onto the bridge? Had it been stolen and dumped? I wish I had been able to take a movie of whoever brought the TV to it’s ignominious demise on the foot bridge. Then I could’ve flashed back and used it as graphic video content for my old Latin class at our Toga Party. I must say, year’s later, do I think Mr. Feser was a bit eccentric? Yeah. That’s one reason I remember him. Good teachers are eccentric. And a little bit of it rubs off on each student. I believe Don had his priorities straight – the Chinese didn’t nuke us. They’ll do it the old fashioned way. With their balance of trade, they’ll just buy US. Submitted by ljhg on Sat, 01/26/2008 - 23:34. MAD Magazine paperback Good and MAD . 1963, 1969 by E.C. Publications, Inc. Submitted by Norm Roulet on Sun, 01/27/2008 - 00:00. Submitted by lmcshane on Sun, 01/27/2008 - 16:04. A green parable?? I will be able to tell you more soon. I've always gravitated to the cadences of Olde English. Lewis Carroll seemed to tap that vein, too. In any case, so far, I am enjoying the tale. Thank you Simon Armitage!! !